I am saddened to discover that I can no longer touch my knees with my nose. I know this may sound a little ridiculous to some of you, but I have always prided myself on my relatively good flexibility. Turns out I was quite delusional. Although I am getting fitter, faster and stronger with all the run training (yesterday's 6km run had an average pace of 5'15" per km) and workouts (today's ab challenge was 105 sit ups, 160 crunches, 60 leg raises and a 1:35 plank, and the plank challenge was a 3 minute full plank), my flexibility is waning considerably. My hamstrings are really tight! Although I can still easily touch my toes without bending my knees, I can no longer fold completely in half like I used to, and for some reason I find this very disappointing. My body is getting older and less supple. So I've decided it is time to change that (well, the suppleness at least), and take up yoga. Perhaps one day I'll be able to do the splits again (I miss being able to do that, oddly enough), but for right now, I was just glad to be able to do my leg raises today without the unfortunately-all-too-familiar feeling of tightness in my hamstrings, after a 30 minute yoga session beforehand. I am unwilling to pay a fortune for yoga classes, and can't get to the free yoga sessions at Lululemon (bad time of the day), so is anyone able to recommend a good yoga DVD? As a complete newbie it's very hard to know which one would be good to start with. Turns out I can't do handstands any more either. It's not the balancing or strength that's a problem, it's that as soon as my body is inverted, pressure builds up so much in my head that my face starts to swell and my eyeballs go all red. It's quite an uncomfortable (slightly painful) feeling. I found this out today while attempting to do the daily hiit workout. Won't be doing that one again, let me tell you! I'm a little less disappointed about this as I am about my flexibility, so I think I can live with this development. Speaking of disappointments, I was a little bummed that last night's dinner didn't quite go to plan. I was making a silverbeet and ricotta frittata, and kumara and leek rosti with garlic aioli. Both were perfectly edible, but it wasn't quite the meal I had in my head. The frittata was a little overcooked on the bottom, and the extra light ricotta wasn't really suited to being used as a topping. Plus, I forgot to season the egg so it was a little bland. The rosti came out fine, but the aioli was a complete bust. I've never made it before, and due to my inexperience used the wrong attachment in my food processor. That, coupled with the oil being poured in too quickly, resulted in not-aioli. It tasted fine but looked rather revolting. Perhaps I should've stuck to the original plan and just made crumbed schnitzel... Oh well... Tonight's dinner should be a little better - leftover silverbeet and ricotta frittata (with lots of seasoning) and Mongolian beef. Not the best combination, but edible all the same. Hopefully. I did have one success yesterday (aside from breakfast which was ridiculously good - bread fresh out of the oven, toasted and served with scrambled eggs (made with cream, y'all!) avocado and feta - yum! ), which will never ever be repeated. I made brown sugar chewies. Dude. It was amazeballs. So good in fact, that out of the 16 pieces I cut out of the slice, I ate ten of them. This is why I will never make that recipe again. I cannot help myself. This inability to control myself may be repeated soon, when I make this Amish cinnamon bread. And I have plans to make cinnamon pull-apart bread for breakfast one morning this weekend. Also potentially problematic. I've said it before and I'll say it again - Pinterest is dangerous! It can be good too though - I found the recipe for these no-bake energy bites (they're really yummy! I added some dried cranberries to mine. Yes, I've grown to like cranberries now in case you're wondering), and these vegan nori rolls (delicious!). I'm looking forward to giving some baked oatmeal a go this week too. We got a couple of persimmons in this week's Foodbox, so I'm going to try this persimmon and cranberry oatmeal recipe (probably halved though, I doubt Deane and I will be able to eat a whole batch between us, even over a few days. And the kids certainly won't eat it!). I'll let you know how it turns out. By the way, do you remember months and months ago (in fact, last year) I was knitting a secret project and promised to show you once the recipient had the item? Yeah, she received it quite some time ago, and I just forgot to show you. Oops. In any case, the project was the Bias 'Before & After' Scarf, that I knit with some laceweight gifted to me by my friend Jill in America. It was knit up into the scarf with some beads added along the ends, and sent back to her. Why, you may ask? Because the name of the yarn was 'Crazy Woman' and I thought she deserved it more than I did ;-P Sadly, I forgot to hang on to the yarn tag so I couldn't tell you what the yarn was that I used, but it was a wool silk mix of some description. 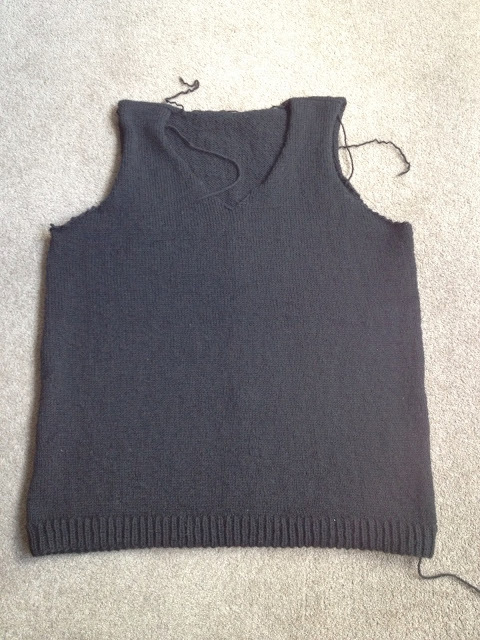 Next on the to-knit list is going to be a Chandail cardigan - the only cardigan in my favourites that a) is knit in worsted weight yarn (which I have enough yardage for), b) is knit in one piece, and c) has a size small enough to fit me. I really wanted to knit the White Pine cardigan but I would have the same problem as the Cassidy cardigan in that the smallest size is for a 36" bust. I was going to knit hoodies for my boys but both have said quite emphatically that they do not want a hand knit sweater for winter, so rather than be hurt by the obvious dissing of my awesome knitting skills (haha) I shall take this as a blessing and happily cast on something else for me. This recent development will also help me stick to the self-imposed stash-only knitting. I'm doing very well so far this year knitting only from stash (or yarn that was purchased at the beginning of the year specifically for a gift, in the case of Deane's Doctor Who scarf). My decision to not go to KAN this year will help me avoid buying more yarn, so let's see if I can get through the rest of the year yarn-purchase free! So, plans for the rest of this week - finish the assignment I'm working on tomorrow, then get Deane's sweater finished over the weekend. Make yummy breakfasts and dinners and very dangerous baked goods for all the in-between times (Hobbits have it right with second breakfast and elevenses I think...). Next week, hopefully start my new cardi. I think the colder weather calls for a snuggly new cardi, don't you? On the workout front, things have been going pretty well. Run training is ticking along smoothly, and next week is the last 5-10km training week. Then it's on to the half training! Woohoo! BodyRock workouts are killer, particularly the ones I did over the weekend and on Tuesday. It was part of a seven day challenge, and wow. It was challenging. But it was so much fun to do! I may just have to do that whole week of workouts again :-) It'd be nice to have all the flash equipment, but my backpack full of yarn (that weighs about 3.5kg) in place of a sandbag and ugi ball, and chairs and a broomstick instead of equalizers will do. At least I have the stationary bike! And plenty of space in the other half of the lounge that nobody else uses. It's become my yarn storage room/home gym. Must dash, the kids are due home any second. I'm off to make vegetable nori rolls. Have a great weekend!! 1. I had a scary encounter this morning on my run. I was heading through Bouzaid Way from Viaduct Harbour Avenue to Fanshawe Street when I saw a man walking towards me. I smiled and kept going. He tried to step in my way but I managed to dodge him, then he waved his arms in my face and started yelling abuse at me. It was a little daunting, and I was very glad it was later in the morning and not my usual running time of around 6.30am. I was also glad that it was at the end of my run and I was heading home. Time for a relaxing cup of tea I think! 2. My fruit and vegetable box gets delivered this afternoon, yay! I'm looking forward to trying a persimmon - I've never eaten one that wasn't dried or baked into a cake. 3. I have sewn together all the body pieces of my Cassidy cardigan, and I'm not sure I like the sizing. One of the downsides of knitting a garment in pieces - you never really know for sure how it's going to look until you've put it together. Also, the sleeve shoulder seams are not to my liking. I don't quite know what to do about that right now, so it's going to sit in a corner while I think about it. 4. We're having apple cider pork and potatoes for dinner this evening, I can't wait! Fingers crossed it turns out as good as the last time I made it. 5. My new blender works fabulously well. I played the role of short-order cook this morning, making stir-fried cauli-rice and spring onions for myself, waffles for T, and a banana berry smoothie for X. I wonder what Deane would've had for breakfast if he was here...? 6. I've found a company based in Palmerston North that delivers free range chicken and pork, and organic beef and lamb. I'll stick with the Green Meadows beef (because it is amazing!) but will order our chicken, pork and lamb from Moreish when we next need meat. I'm so happy to have found reliable New Zealand sources for all our meat, eggs, fruit and vegetables. Fresh local product, healthy, happy, well looked after animals - what could be better? 7. I got an A+ for my first Information Industry assignment, yaaaaaaay!!! Now, on to the second assignment. So much stuff to tell you, expect a crazy mish-mash post. This is a week in bits. It was around this time it occurred to me that I may be able to finish the scarf in a week, and have it done before we left to go home. The race was on! Not much to show for all that time really, is it? Then, it was onto the fringe. So we arrived in Napier Sunday evening, and spent Monday fluffing around going shopping and getting my broken food processor replaced with a swanky new one (yay!!! ), plus I did a BodyRock workout and 140 squats. Mum cooked an amazing roast lamb dinner (my favourite meal). Tuesday morning I headed out for a 6.5km run along the riverbank near my parents' house, using the Rotary pathway, then did BodyRock. On Thursday I had a rather lovely 8.5km run through the hills of Taradale - Puketapu Road (twice) and Cumberland Rise, plus BodyRock and 155 squats. The boys stayed at their nana's for the night, and I spent the evening with my BFF eating Chinese takeaway and waaaaaay too much chocolate while watching Thor and The Avengers movies. Awesome evening. On Friday I squeezed in a quick 3.8km run, my BodyRock workout and 160 squats before heading around to my sister's for the day to look after the four kids (her two and my two) while she went to work. It was a surprisingly stress-free day. I guess when there's enough kids, they manage to occupy themselves quite well. Conveniently, Saturday was a rest day for the squat challenge, BodyRock 30 Day Challenge and my run training, so we packed up and got on the road at 8am to head home, and arrived in time for a late lunch. We lucked out with the weather too - it didn't rain until after we got home. I was lucky with the weather again this morning, managing a 9.5km run before the rain arrived - I was finishing up my 180 squats when it started. And just so you know, doing 180 squats right after a 9.5km run is REALLY HARD WORK! Having said that, they're helping a lot with my knees - the muscles in and around my knees are really strong now, which is helping me run longer distances. My knees still hurt after about 5km, but I think that's just something I'm going to be dealing with long-term anyway. It's not bad, and they only get sore to a certain point then don't get any worse, so I'm going to keep going. I'm not giving up on my goal to run a marathon that easily! I came across a company during the week via Facebook that looked interesting - Foodbox. I ordered The Big Bang box for this week, which will be delivered on Tuesday. I'm really looking forward to it! This week's collection of fruits and vegetables are new season potatoes, carrots, red onion, broccolini, baby white cabbage, swede, baby spinach, kale, lebanese cucumber, cherry tomatoes, 'fancy' lettuce, spring onions, mung beans, mandarins, persimmons, feijoas, ambrosia apples, bananas, kiwifruit and lemonade apples. Yum yum yum!!! I think it'll be great fun to have this delivered every week, and will enjoy the challenge of trying to incorporate the fruits and vegetables into the weekly meal plan. I have registered to have the Big Bang box ordered weekly at this stage, and will assess how that goes over the next couple of weeks. If we need more, I can get a bigger box. Less, get a smaller box. Or we can change the frequency of the delivery. This is such a fantastic idea! And it means less trips to the supermarket, as the main reason for weekly shops was to get fresh fruit and vegetables. Now, I can stock up on staples and shop less frequently. Might have to add eggs to the fruit and veg delivery though. I love that you have this option too. Awesome stuff!! I'll let you know how it goes. In the mean time, anybody got any good ideas for persimmons? I know how to bake them into a cake, but would love some different options aside from adding them to a fruit salad or eating them on their own. Tomorrow is back-to-school day (HURRAH! ), and the boys will have fresh bread and a butterscotch cake to go in their lunch boxes (gotta love routine). I will be getting stuck into an assignment, and possibly looking at that calculus workbook I have to get through so I can study Statistical Analysis next trimester (urgh...). The house needs a good clean so I'll be getting back into the cleaning calendar too. It will be the fourth and final week of the BodyRock 30 Day Challenge, and I'll be nearing the 200 mark for the squat challenge. Next weekend, I'll have cracked the 10km mark for run training. Yes! !